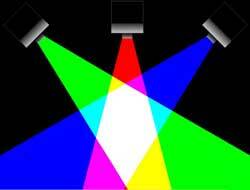 How can Red , Green and Blue light generates millions of colors, It's important !!! Today who wants a b/w TV or computer screen , how only 3 colors can generate so many colors....This animated physics (optics) software gives in-depth information about wavelenghts of light and is very useful for schools. What are primary & secondary colors? What is an additive process? What factors determine the color of light? Water is blue - green but froth is white? Why are danger signals always in red color? The froth of any liquid is always white while the liquid may be dark or colored? Red, Green and Blue are primary colors as they cannot be obtained by mixing any color in any proportion. But they can generate all the colors known to us by combining in different intensities. On combining in equal ratios primary colors give different colors. Green and Red combine in equal proportions to form Yellow colored light. Blue and Red combine in equal proportions to form Magenta colored light. Green and Blue combine in equal proportions to form Cyan colored light. Yellow, Cyan and Magenta are three secondary colors. When light of these primary colors is added together in equal intensities, the sensation of white light is produced. The shade of a secondary color obtained depends upon the intensity of light of primary colors. If Red & Green of equal intensities are mixed give Yellow but if Red component is more then Orange shade (i.e. more of Red side). In mixing of primary colors all the colors add to give a new color, hence this process of combining of light colors is called an Additive Process. Ans: In the 1950s, surgeon’s attire was mainly white in color to emphasize cleanliness. However, the combination of bright operating lights and an all-white environment led to eyestrain for the surgeon and staff, and additionally, many people found the sight of bright red blood splashes on a white gown or drape rather off-putting. So later most hospitals abandoned white apparel in favor of various shades of green, which provided a high-contrast environment and reduced eye fatigue.